At this point, we only have a handful of friends and family looking at the site. Truth be told, it’s mostly our Moms’ doing beta testing. Our Moms’ have already weighed in on some features and suggestions, and we are once again reminded that the site is not “Mom-enabled”, but that’s ok for now. I think we’ll get there. But it is really clear that we have a long way to go before we pass “the Mom Test”! Interesting stuff. Wish we could use moms a bit more in the development projects. The premise for my mom’s appearance was this: People are always saying that they want to make a product that’s “easy enough for their mom to use.”? Well, we want to do something more. My mom knows how to use a computer so it’s not just about ease of use: I want to make a product that my mom actually wants to use. This got me thinking about personas. 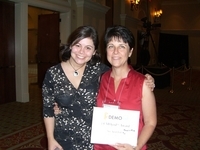 Maybe a “Mom”-persona should always be included when working with personas? This entry was posted by Jesper Rønn-Jensen	on Tuesday, April 4th, 2006 at 12:00 (GMT-1)	and is filed under Usability. You can follow any responses to this entry through the RSS 2.0 feed. Both comments and pings are currently closed.